Bundle and save. 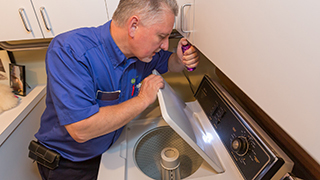 For $149.99, we’ll perform a 31-point inspection on your washer and dryer. Why is maintenance important for laundry appliances? Regular maintenance of your laundry appliances can help prevent costly breakdowns, reduce energy costs and extend the life of your appliances. Didn’t buy them at Sears? Not a problem! Our technicians know all the top brands. Our experienced techs will complete all the tasks listed below for $149.99. Check the fill cycle and water temperature for wash settings. Ensure correct pump out and spin cycles. Check for excessive noise and vibration during spin cycle. Check timer for correct operation. Inspect belt for wear and adjust tension (belt drive washers). Check motor coupling mechanism for wear (direct drive models). Verify clutch/shifter mechanism is functioning properly. Check for proper spin and agitate speeds. Check door/lid lock for proper alignment and operation. Check tub and hoses for leaks. Check drain pipe or laundry tub. Inspect motor coupling for wear. Check door boot for leaks. Verify pedestals and/or stacking kits are properly secured. Check fill and drain hoses for proper connection. Check air dome for debris and pressure hose for secure fit at pressure switch. Inspect door bellow and dispenser areas for buildup; advise on cleaning/maintenance. Check front and rear drum seals. Check the drum belt, idler pulley and support rollers for wear. Check the exhaust system for leaks, kinks, or obstructions. Cycle check the burner for proper ground and secure connections. Inspect electrical systems for proper ground and secure connections. Check thermostat temperatures and verify high heat. Check time for correct cycle operation. Check moisture bar operation and clean the moisture bars. Check gas line and connections for leaks. Check machine component functions by operating dryer through short cycle. Vacuum the inside of the dryer.